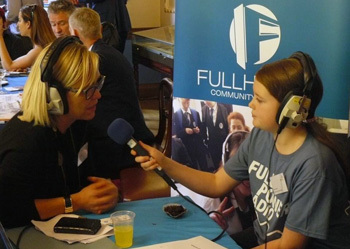 Fullpower were invited to attend the Shine School Media Awards at Stationers' Hall in London on Tuesday 21 June 2016 to broadcast live from the event. The awards are an exciting initiative for teachers of English, Art & Design and Information Technology to put pupils’ media and communications achievements in the national spotlight. The Shine School Media Awards are designed to encourage team working by pupils to produce a school magazine, newspaper, newsletter, digital edition or website. Listen to extracts from the broadcast on YouTube. "Having the team from Fullhurst Community College support the Shine School Media Awards 2016 was a sheer delight. The student's enthusiasm and dedication was impressive and everyone enjoyed their interviews. The fact that the Shine Awards day was being broadcast by FullPower Radio changed the dynamic of our competition and helped create a multi-media event. This was the first time that we had experienced a radio broadcast and following the 2016 awards the committee discussed how successful it had been. We are now planning to have a ‘Radio’ category for the awards in 2018 and we are already in discussion with a prospective sponsor, RadioCentre. I cannot thank Fullhurst enough for their support and I do hope that they will join us for the Shine Awards 2017. It really would be our pleasure to have them at Stationers’ Hall."